UNAC/UHCP bargaining teams continued negotiations on August 14 and 15 for six local contracts covering health care professionals at Kaiser. 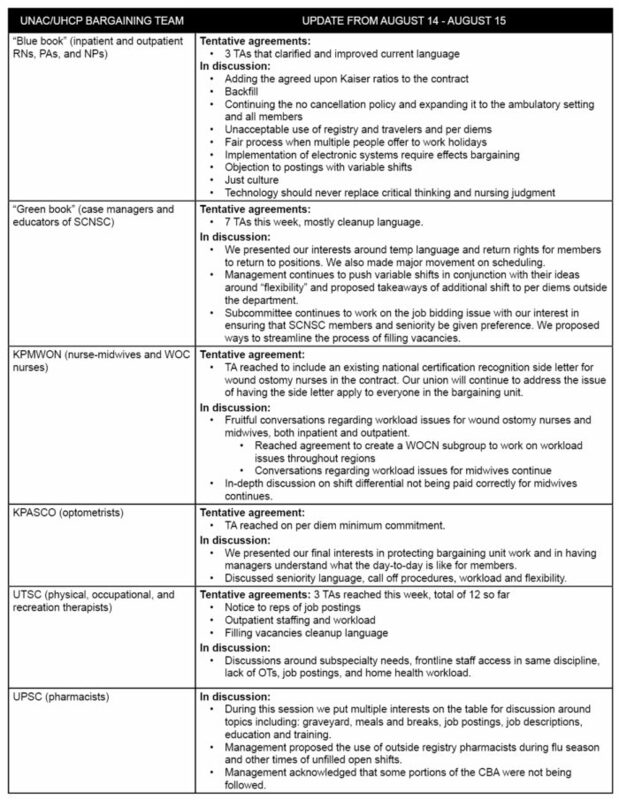 Most teams cleaned up contract language through tentative agreements (TAs) as our union continues to ensure that Kaiser is the best place to work and to receive care. August 15 was an emotional day for the “blue book” bargaining team. There was not a dry eye in the room as UNAC/UHCP registered nurses gave powerful testimonies on what it’s like to work short–day in and day out. Staffing doesn’t affect just the workers. Poorly staffed units can ultimately endanger patients. “There are patients we can’t forget when we clock out,” said a Kaiser ER nurse, who tearfully shared the tragic outcome of an understaffing story with the “blue book” team and management negotiators. Story after story from UNAC/UHCP members exposed the dangers and risk of poor patient outcomes when there are not enough staff to meet core needs. “It was really powerful for members to take time out on their day off and come here and pour their hearts out,” said Nicole Lam, labor and delivery RN and hospital president of Kaiser San Diego Health Care Professionals Association (KSDHCPA). After the testimonies, chief negotiator Suzanne Delaney, RN, presented major interests to make staffing safer and presented a stack of 1,000 staffing objection forms collected in a single month. Other bargaining groups confronted issues with staffing and workload, and other challenges. While progress is being made at most tables, many are engaged in deep discussions that will get more difficult. It is more important than ever that we stand united with our bargaining teams. Wear UNAC/UHCP blue on August 20 to show solidarity for improved wages and benefits. Continue to read our bargaining update emails. Watch and share our videos on YouTube and Facebook. 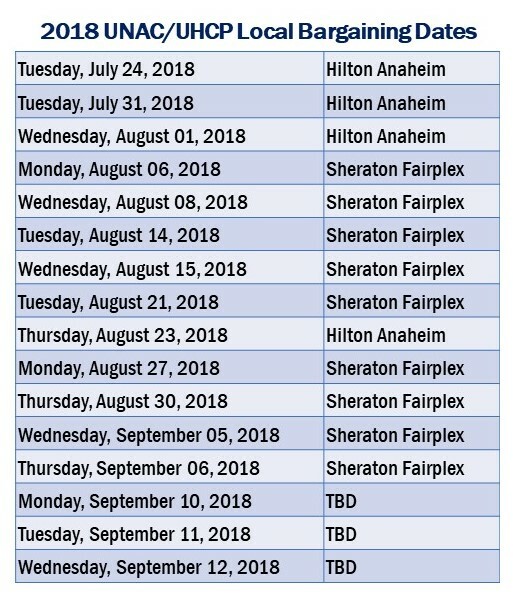 Local bargaining continues August 21 at the Sheraton Fairplex in Pomona. See the full schedule below.